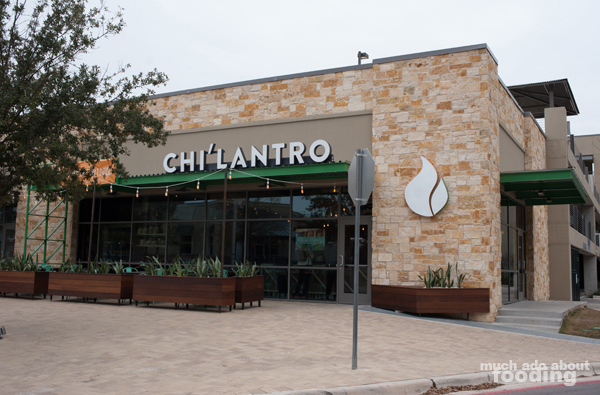 A huge congratulations goes out to Chi'Lantro for opening yet another location, this time in South Shore in Austin. 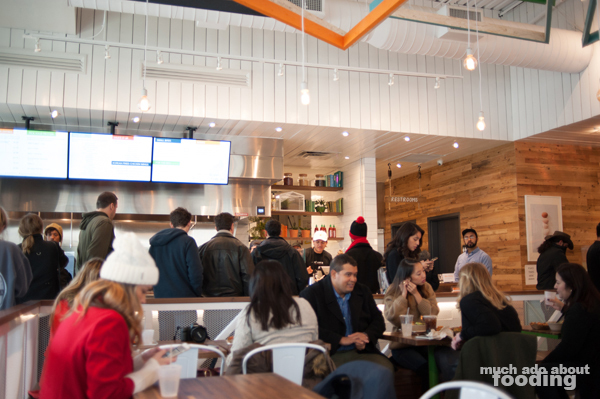 What had started out as a food truck has now expanded to include multiple brick-and-mortar locations; it reminds us a little bit of the success story of one of our favorite fast casuals back in Orange County - Slapfish. Chi'Lantro brings something unique to the land of barbecue and that is the Korean inspiration. Korean barbecue (fondly known as KBBQ many places) gives a different flair to the meats here, and when we saw that they were having some soft opening events, we decided to hop to them and check them out. Chi'Lantro hosted events yesterday January 6 from 12:30pm-2:00pm and 6:00pm-9:00pm and will host one later today, January 7 from 5:00pm-9:00pm. At a maximum of one entree per person, the menu will be free during those time periods to those who attend to show their support of the opening. Though the food and drinks were complimentary, guests are presented the option to make a donation in exchange for the freebies - all donations go on to assist local charities Carebox Program, Austin Animal Shelter, Mobile Loaves & Fishes, and Children's Tumor Foundation. It was certainly a kind gesture to contribute back to the community. We had experienced Chi'Lantro before, via their food truck, during a conference and really enjoyed what they had to offer. 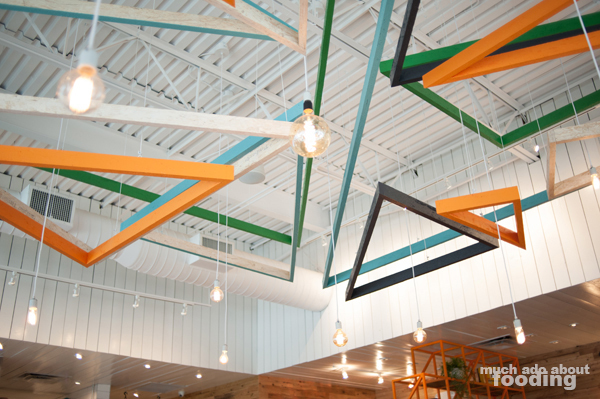 The in-store experience is much like the widespread build-it-your-own fast casual restaurants out there these days; you select bases, proteins, toppings, and sauces to fit your fancy. We began with an order of their Korean Fried Chicken Wings ($7.50/6 piece - Gangnam sauce) which came out wonderfully crunchy on the outside, moist on the inside. Whenever I have Korean fried chicken, I always marvel at how they can maintain two such differing textures within one piece. 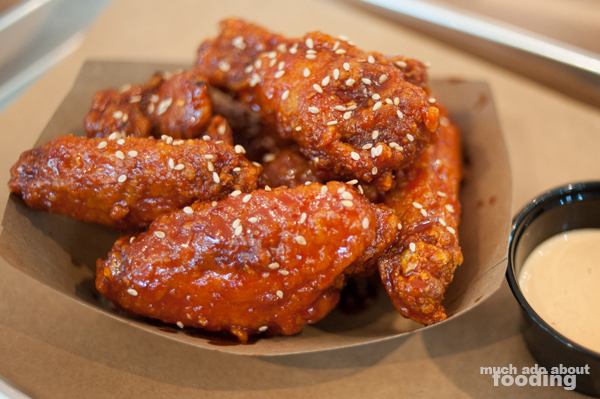 The Gangnam sauce added a pleasant sweet and spicy kick to each piece. Overall, a definite must. Then I stuck it out for a traditional set-up of The Original Kimchi Fries ($7.99 - spicy pork, caramelized kimchi, Cheddar, Monterey Jack, onions, cilantro, magic sauce, sesame seeds, sriracha) which meant I let the experts choose their magic. Though the restaurant is a build-your-own style, I wanted to experience what fully entailed their signature dish that put them on the map. My initial impression beyond just the first look (so colorful and rich!) was that they stacked this high; it easily was an entree of its own. 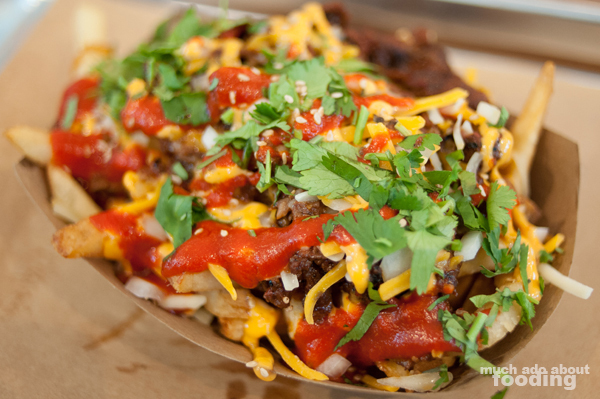 With all of the pieces together, the fries made for a spicy meal though - you got hit with spicy protein, spicy kimchi, and even a generous dosage of sriracha. This is a knife and fork dish, folks. 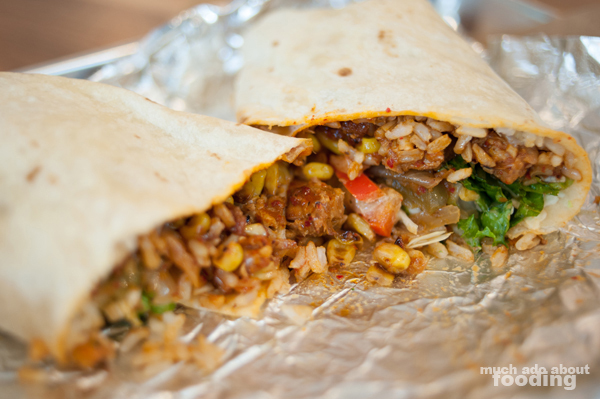 Duc's Burrito ($7.99 - spicy chicken, lime buttered brown rice, black beans, lettuce mix, homemade kimchi, salsa, grilled corn salad, magic sauce) was no joke either but we wished it had been wrapped tighter. Sorry for the flat, spilling shot; the stuffed innards just fell out once we split the burrito in half. Regardless, the flavors played well together and made for a solid meal. I can see this being a fantastic to-go option for those lunchers that need to dash. If you want to check out the newest location of Chi'Lantro, visit them at 1414 Shore District Drive, Suite 102, Austin, TX 78741-1328. 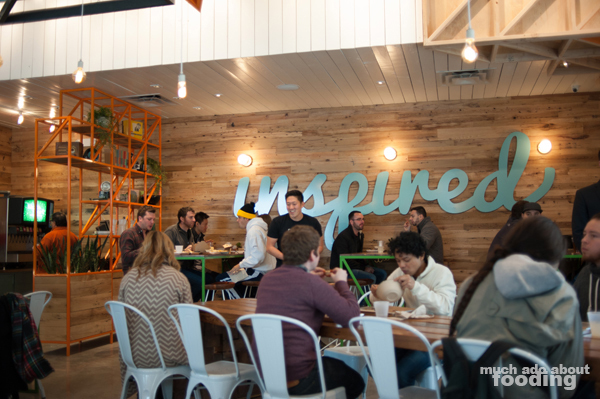 They are located at the end of the building and have ample seating space inside.